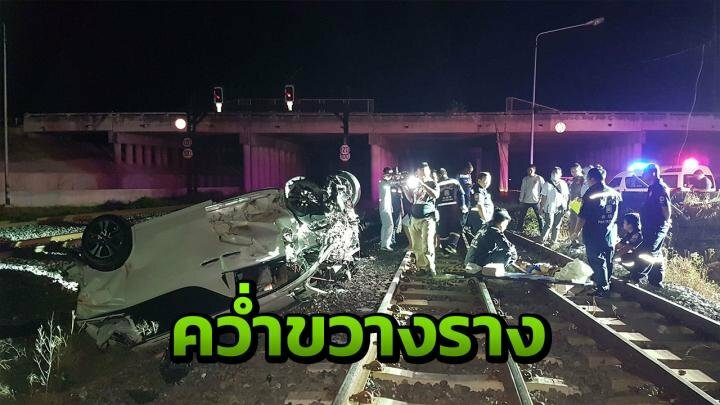 The Muang Ayutthaya police station was alerted of the accident at the u-turn under the Ban Ma flyover on the Asia highway's frontage in Tambon Ban Ma of Muang district at 4.30am. ell onto the tracks and was crushed to death by the van before it was hit by the train. The train badly mutilated his body, said police. Warasan Jarawichit, 40, was hurled into the grass beside the tracks. He was rushed to a nearby hospital. It was not yet certain who was driving the van, police said. Police found that the barrier at the u-turn was hit and a power pole toppled by the van’s impact. The Nong Khai-Bangkok train was driven by Supachoke Linkanchanabutr. He said he spotted the van as the train approached the Ayutthaya station, but the train’s momentum prevented him from stopping in time. A motorcyclist, Sumet Sinthusaeng, 42, said he was riding his bike on the flyover above the railway and he saw the van hit the barrier and flip. He rushed down to help just as the train hit the van, and found a man lying beside the railway. He later spotted a body on the tracks, Sumet told police. The first of the Songkran deadly days perhaps, a bit early I'll admit but both flung from the pickup indicates no seat belts, fools. I know the person who fell on the grass. He's a successful businessman located in Pattaya. Their families are being gutted by this accident.